I attended the spring Hip Handmade Market, way back on Day 88. It was a located in Webb City and not only was it a first for me, it was the first time this event had been held. I was impressed with the vendors and variety of product. I left thinking it would be very cool to see this show expanded, with even more vendors and more items to choose from. Well, the Hip Handmade Market did just that. Their fall show, moved to 102 S. Joplin, in Joplin, occupied a larger, easier to navigate space, increased the number of vendors, offered a larger variety of merchandise and had a drink and dessert bar set up. There was music also, I believe, although I didn’t hear any while I was there. My firsts today all occurred at this event. On Hip Handmade Market’s Facebook page, they describe themselves as an indie-craft market, specializing in unique and interesting items, and supportive of local artists and craftsmen. Vendors offer a wide array of handmade products including jewelry, clothing, artwork, paper goods, soaps, pottery, vintage finds, photography and many more items, some defying a category! I enjoyed a quick trip through the market, snapping pics and looking over merchandise. I saw mostly new vendors, compared to last spring, with a few favorites back with their fun wares. 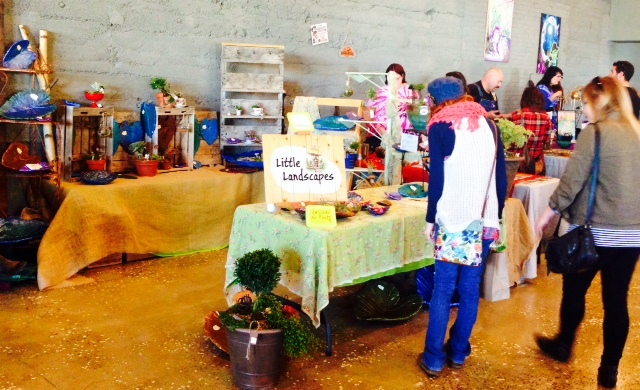 Ozark Nursery had a miniature garden booth set up. Of course the green growing plants, with tiny figurines, bridges and birdbaths, drew me. To my delight, I found that the nursery is offering monthly classes on making your own miniature, or fairy, gardens. You bring a container, and $20, and they supply the potting soil, a plant and a miniature item for the garden. I signed up! Another booth, Ozark Riviera Designs, caught my eye with its handmade jewelry. They use interesting pieces such as vintage silverware and coins to create beautiful and unique items. With the help of the kind proprietor, I looked through the assortment of rings made from coins, in hopes of finding one made from a one pence coin. I wanted it as a reminder of my Scotland trip. What I found was one that fits my right pinkie finger perfectly, made from s shiny new penny. It’s a lucky penny ring, the jewelry maker assured me. 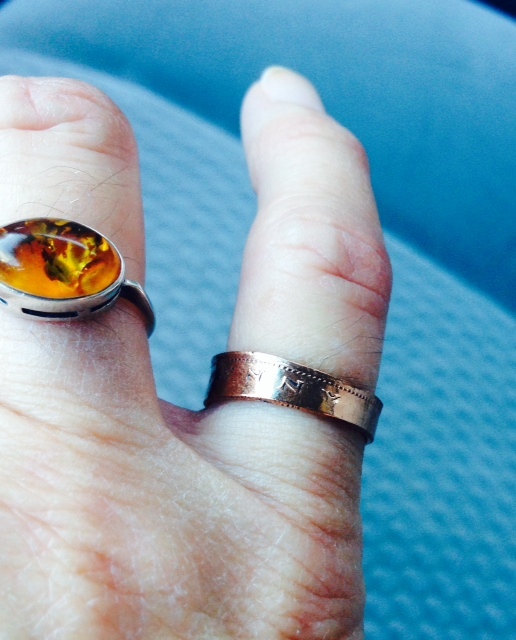 I decided the pretty coppery ring was a perfect reminder of the whole year, not just the trip overseas. This year has been about shiny new experiences and opening to my path and who I am, all while moving beyond my comfort zone and into more freedom, more life. It has been a year full of growth and opportunities. That’s a lot for such a small ring to represent, yet every time I look at the band, encircling my pinkie, I’ll smile and remember what it signifies. I’ve already caught myself idly spinning the ring around and around on my finger. We are building a relationship, this ring and I. I’m excited to have found it. 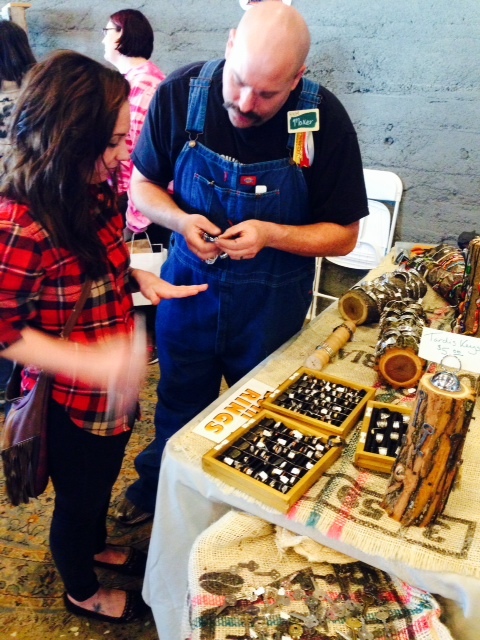 The creators of the Hip Handmade Market call this event Southwest Missouri’s hippest craft show. I agree. I see nothing but great things ahead for this market.